Warner Bros.' new digital content division, Blue Ribbon Content, recently announced that it was producing a new Mortal Kombat X related digital series, slated to debut around the release of Mortal Kombat X in April 2015. 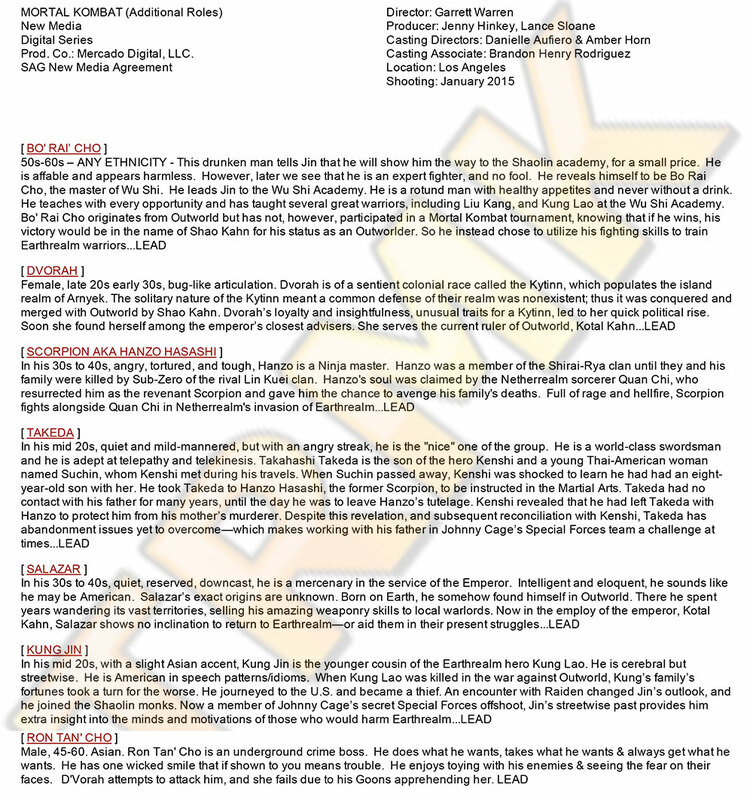 TRMK has obtained an exclusive look at the casting notice for this new production and it details some new and potentially unannounced characters featured in the next Mortal Kombat fighting game. Some of the characters listed we've heard their names before associated with MKX, like D'Vorah. Another character, Takeda showed up in the comic released this week as the son of Kenshi and is not the Takeda mentioned in prior folklore. He is rumored by the kommunity to become a ninja known as Forrest Fox, but this is not mentioned in the bio. On the new character front we have the familiar name Bo Rai Cho who is being mentioned for the first time in association with MKX. 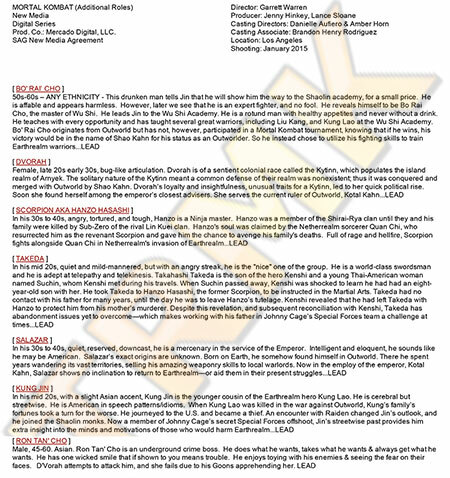 There are also three completely new names: Salazar, Kung Jin, Ron Tan' Cho each with some interesting bios. No relation is mentioned between Ron Tan' Cho and Bo Rai Cho, surprisingly enough given the similar names. There is currently no way to draw conclusions between any of these characters and their playability in the MKX game, but it'd be a safe bet they'll show up along the way in the likely character deep Story Mode as at least a cameo role. Also of note, the listed director Garrett Warren was the Stunt Coordinator and Second Unit Director on the MK Legacy series previously. This appears to imply that he may now be the full director of this new series and that Kevin Tancharoen is not returning to the directors chair. It also appears that the new series will begin filming this month. This Saturday the legendary Galloping Ghost Arcade is hosting another Mortal Kombat Tournament Special event that should not be missed if you are in the Midwest. For those of you unaquinted, Galloping Ghost Arcade is located in the suburbs of Chicago in Brookfield, IL and is home to more arcade machines than any other arcade in the USA. The arcade is also run by huge Mortal Kombat fans and often have the cast of the original games show up for special events. They even have custom made arcade cabinets for both Mortal Kombat (2011) and Injustice: Gods Among Us. I have no doubt that next year they'll have a Mortal Kombat X cabinet. This MK event like the previous event back in January, will have many actors from Mortal Kombat, Mortal Kombat 2 and Mortal Kombat 3. in attendance. But this event has the largest lineup yet of Mortal Kombat actors yet who will be making appearances, so if you are looking to just meet them or get autographs, this is the day to go! The event starts this Saturday June 28th at 11am and runs all night until close at 2am, with the actors stopping by when they can and tournaments running throughout the day. It'll also be streamed to the gallopingghostarcade Twitch channel for those who can't attend. Or are busy that day and just want to watch later. For more details and updates, sign up on their Facebook Event post or just show up that day. Sadly once again I can not attend due to previous plans, but hopefully you MK fans can! But hopefully we can get a report or two from the fans in attendance again.